Alcohol and Drug Abuse Prevention and Awareness | Colorado Mesa Univ. Colorado Mesa University expects all members of the university community to be responsible for their own behavior within the context of state and federal laws and university regulations. Promote responsible use for those who occasionally drink alcohol or use. Read more about CMU's drug and alcohol policies in The Maverick Guide. PFL is an evidence-based motivational prevention, intervention and pretreatment program specifically designed for people who might be making high-risk choices related to the use of drugs and alcohol. The PFL classes are offered on Tuesday's and Wednesday's when school is in session from 5:30pm to 6:30pm or on Saturdays from 12pm to 3am when school is in session. Call 970.644.3740 to to learn more about this program. 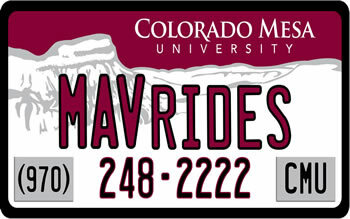 MAVrides is a student-operated organization that offers free, safe rides to Colorado Mesa University students. MAVrides is a CMU-funded program that operates on Fridays and Saturdays from 9pm to 3am. Call 970.248.2222 to arrange a ride, volunteer as a driver or navigator or to learn more about the program.